Richfield Regency is a catering company in North Jersey that honors elegance, romance and tradition when it comes to special events. Richfield Regency specializes in catering for banquet hall events, weddings, Bat/Bar Mitzvahs, corporate occasions and more. With have a variety of menus, including kosher and non-kosher items, their own wedding chapel and off-premise catering services offered, their goal is to help create memorable moments for all of their clients. When Richfield Regency came to G.A.L. Inc., they had an existing website that we optimized for them, in addition providing them with marketing services. 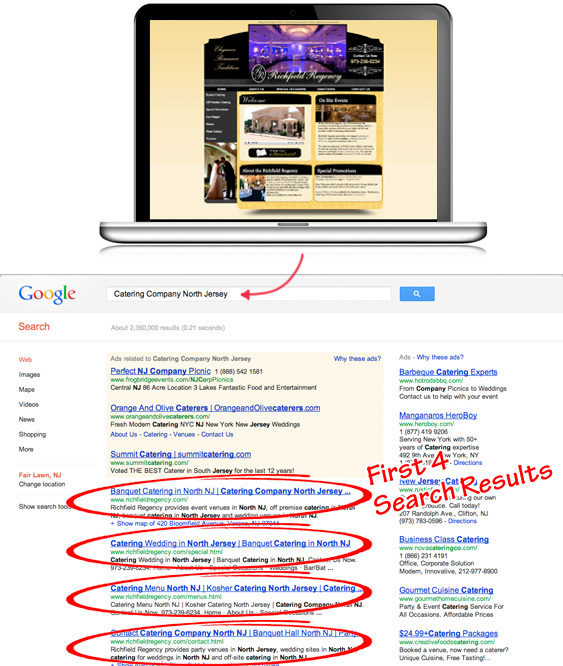 Richfield Regency now holds the top spots for their services on Google on page one. As a result of their website launch, Richfield Regency saw an immediate increase in the amount of business they receive. "I highly recommend GAL Inc., Corporate Web Solutions. I have been working directly with the Internet Consultant since the beginning of 2012 and am very pleased that all the promises that were made to me regarding the solutions to my online media were addressed. She always responded to all my questions and concerns in a timely manner. As a result of using GAL Inc., for their marketing solutions, more traffic is being driven to my website everyday."